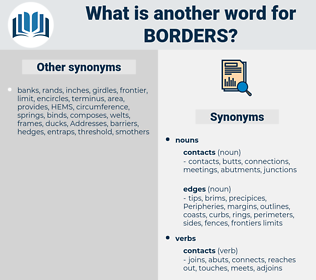 What is another word for borders? neighbours, international, gates, grenzen, centre, Movements, open, european, programme, goods, edge, edges. boarders, authorities, outskirts, internationally, checkpoints, Territories, transnational, routes, restrictions, shores, jurisdictions, distinctions, restricts, passengers, nearby, transparent, operations, suburbs, Refugees, professionals, foreigners, procedures, doors, rules, members, divides, ends, fringes, stripes, terms, closures, shortcomings, parameters, limitations, fields, Organizations, woods, mainland, kerbs, inland, limites, obstacles, dams, Rights, curbs, fences, divisions, documents, ranges, ukraine, hurdles, constraints, Crimes, issues, circles, premises, Communities, amendments, technologies, installments, rims, Islands, ceilings, scope, horizons, leads, framework, frameworks, Lorries, points, rates, statements, banks, levels, margins, projects, instalments, TOES, Vehicles, values, places, Persons, Economies, products, controls, walls, Maps, forces, status, contracts, individuals, Ones, adoptions, depths, plates, caps, Industries, markets, frames, payments, touches, batches, Soils, aliens, waves, neighbours, states, passes, Parties, stages, ages, engines, gates, goods, edges. 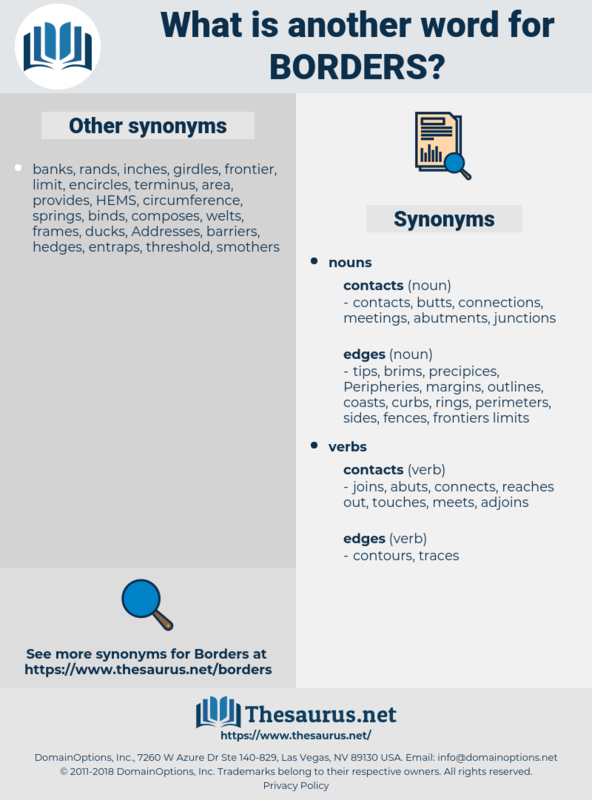 frontier, frontiers, boundary, Boundaries, bordering. crossings, thresholds, neighbors, Areas, zones, frontiers, sides, sectors, lands, Countries, LINEs. It inspires us with the hope that so long as Italy remains true to the cause of democracy, which is the cause of justice and enlightenment, so long will the Jew be free and safe and happy within her borders! He is now just on the borders of Esau's country, and close upon opening communications with his brother.